Now to find out if Hidden Horrors lurk below the surface. 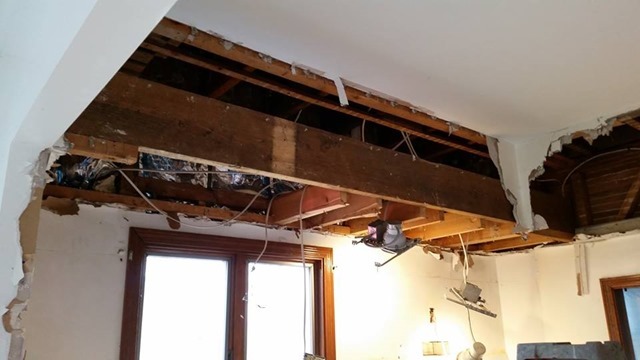 With luck, the structure revealed by the removal of the soffits existed purely to form the soffits. It doesn’t appear to be weight-bearing, but The Experts will advise us tomorrow. On the other side of the room, my back-door cabinets are also gone. Totally gone. More updates as things develop further. Photo credits and thanks to the Resident Male, for documenting today’s progress. Things here at String Central are about to be totally up-ended. We’ve now lived in the New House for about 10 years, which makes it not so new any more. In truth it hasn’t been new for quite a while, having been built in 1911 or so. When we bought it we looked around and fell in love with the place. 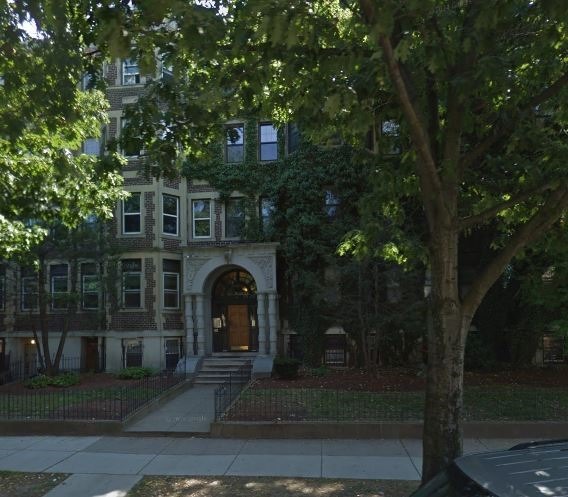 Some parts more than others: the large, open layout, the abundance of surviving original woodwork and detail, the high coffered ceilings in the living and dining rooms, having a tiny library(!) plus sufficient space for all of the bedrooms, office areas, and workrooms a family with a wide variety of solitary pursuit interests needs. 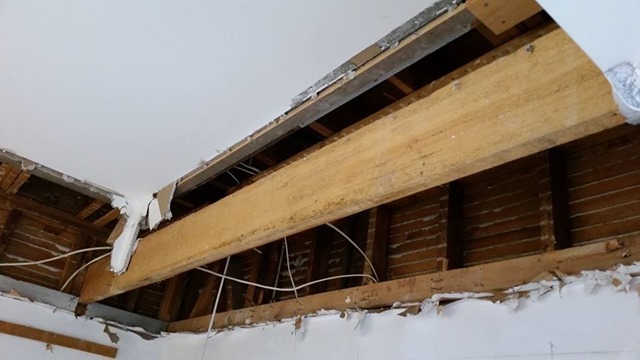 On the problem areas, we’ve gone through a long list of improvements over the years, most having to do with systems: heat, insulation, wiring; or structure. 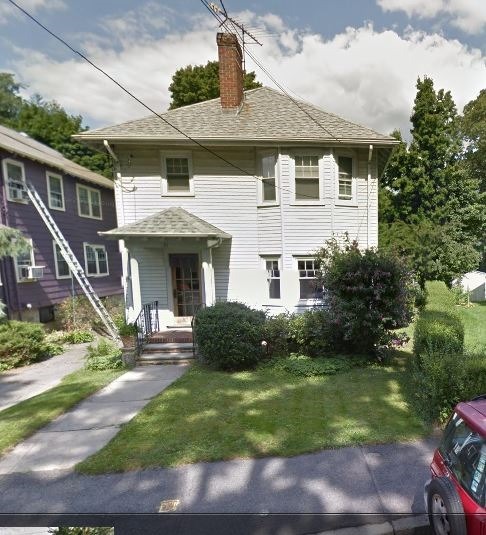 New plumbing, a full-house rewire to get rid of (barely) functioning knob-and-tube, secure/weather-tight basement windows, a new heating system with a separate upstairs heat zone, insulation, a new roof, and a new driveway are just a few. 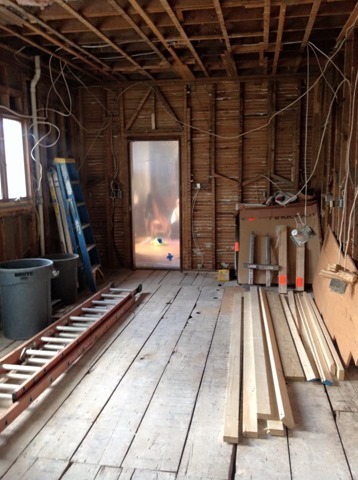 Other than rehabbing the poorly functional upstairs bath, we haven’t done much in the way of aesthetics or livability, beyond addressing basic needs. 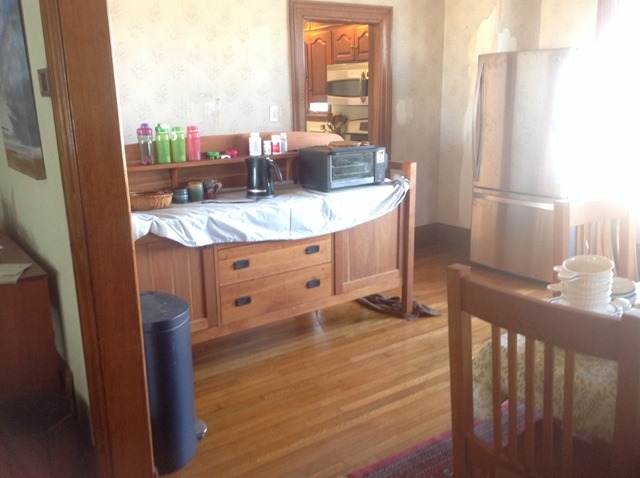 After 10 years we are about to begin a major kitchen rehab, and FINALLY be rid of the sagging mint Formica countertops, the droopy cabinets, the dismally scratched (and hideously pink) floor tile, plastic sheet backsplashes; and the outdated, poor functionality of our layout. I can hardly wait! 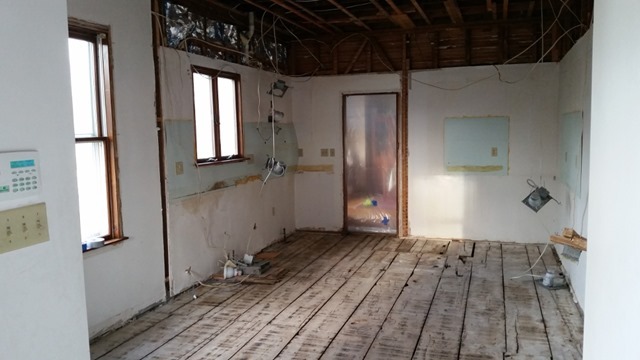 In the shots above you can see the partial wall between the prep and dinette areas, that breaks up the space without adding value. 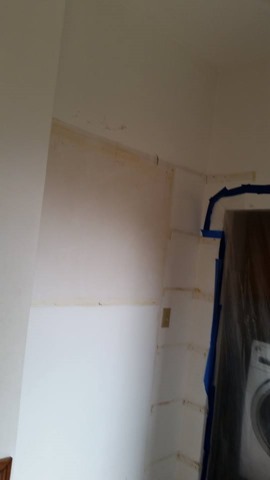 They are remnants of what had originally been a full wall, separating a back day-room for maid’s work from the kitchen proper. This is now our eat-in area and will remain so, but the partial wall is going. 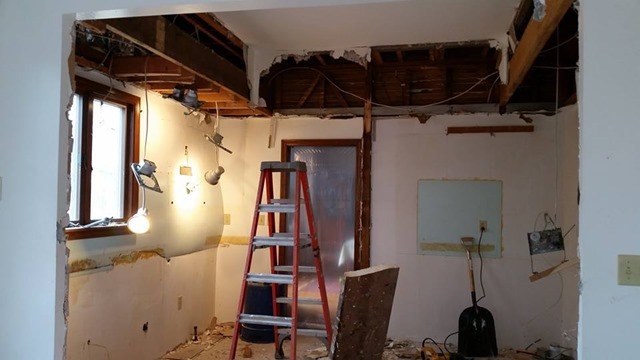 In this one you can see the patched- in wasted space above the cabinets in between them and the equally useless dropped soffits above the cabinets themselves. That overhead space will be put to far better use. 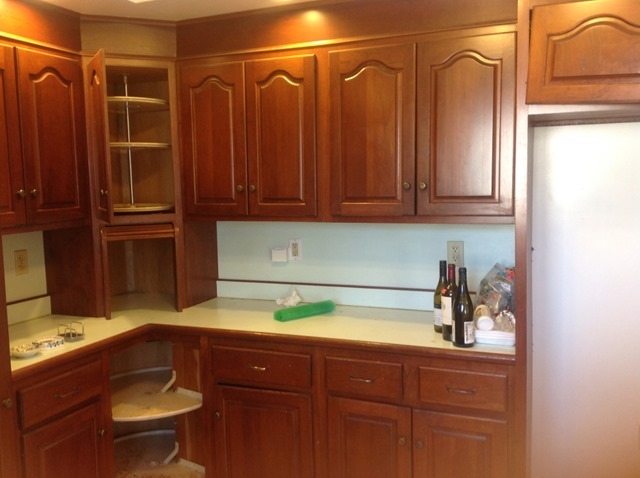 And here are the mint green counters and plastic backsplash of the inconveniently far from everything Other Counter. It’s the clutter-magnet area where we stash recycling, and although absent in this shot, where pantry overflow usually sits. This space will also no longer sit idle. Although we do have an pantry, it is of very little use, with narrow shelves too shallow to accommodate most cans, boxes, or jars. The front part is a hinged armature that is very difficult to move if you want to access similarly shallow dead shelf space behind. We are in sore need of effective pantry space. The new design will address this, too. The rusted, creaky round-abouts (lazy susans) are an invitation for stuff to fall behind and jam the mechanism, with center poles that preclude larger items. The gadget garage isn’t bad, but tends to be another clutter-magnet area, and uses up more useful space than it provides in return. 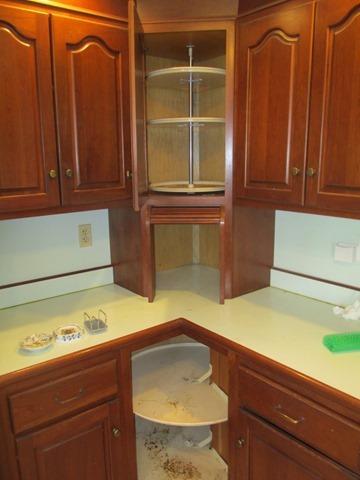 Technology for corner cabinetry has vastly improved since the ‘80s. I’m looking forward to the new solution. 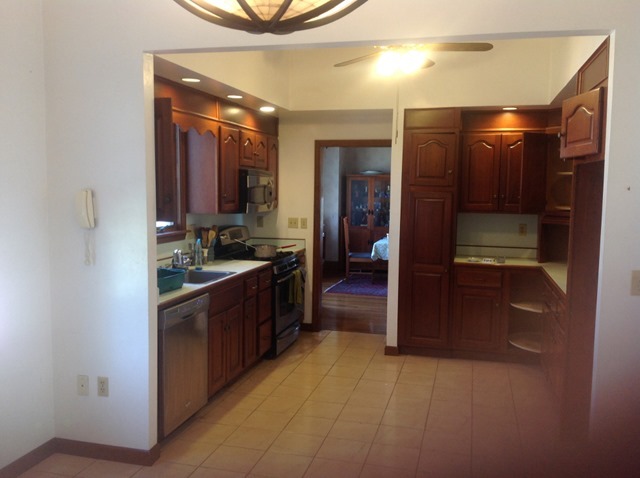 On overall design, the current kitchen/dinette area, although it looks large, is not wide enough to add an island or peninsula without serious bottleneck or access issues, so we are not going to radically change the footprint. 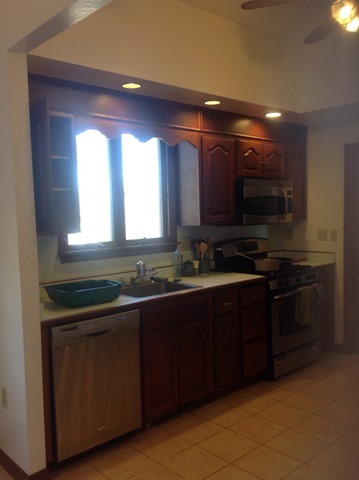 However, the current arrangement of appliances and countertops isn’t very efficient. We end up doing 90% of our prep work in the two foot space between the sink and the stove. The stove itself does not have a vent to the outside, which doesn’t add to ease of keeping the room clean. And the kitchen is dark, with too many lights that don’t manage to provide illumination of the actual work areas. So it’s time for all of it to go. We plan to address all of these issues. Stay tuned to see how! For my knitting and stitching pals – don’t worry. This isn’t going to turn into a home-improvement blog. I continue to plug away on the wavy infinity scarf/cowl, plus progress on a pair of socks. I always have a pair going, as “briefcase knitting” to do while waiting for appointments, on line, or in other away-from-home-base moments of idleness. It’s slow going. As I’ve said before, I spend as much time untangling as I do knitting. And I still need to pay attention to the pattern. I haven’t memorized the thing yet. 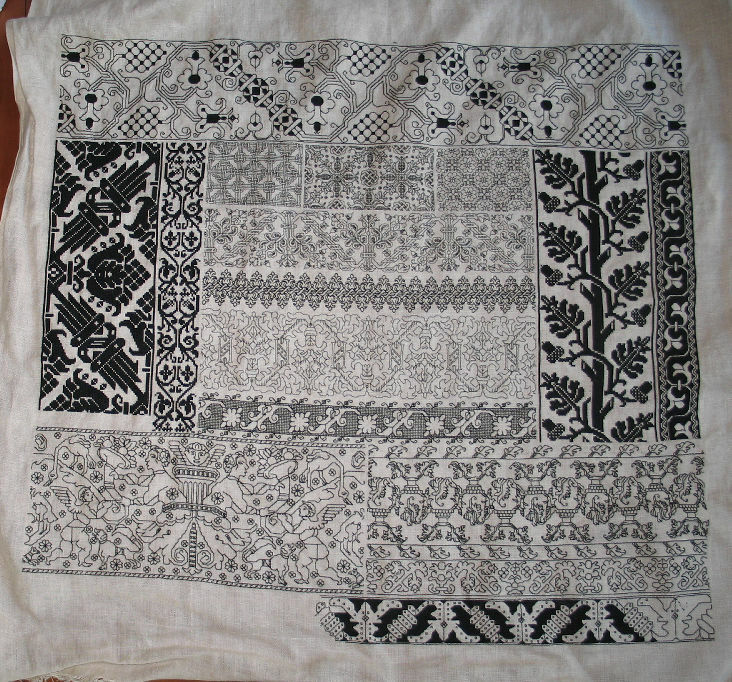 So it’s difficult to do when I’m watching TV in the evenings – my favorite time to do handwork. Especially so because we’re re-watching our set of Lone Wolf and Cub TV series DVDs, which are in Japanese with subtitles, and on Netflix, the Norwegian series, Occupied, similarly subtitled from Norwegian. So there you have it. Chaos is about to descend. But at least I can knit my way through it, while nibbling sandwiches in the dining room. It’s been lonely here at String. So few posts over such a long period of time. I apologize for that. Life has been hectic, with work deadlines, the close of Younger Daughter’s school year, and house projects just getting under way. 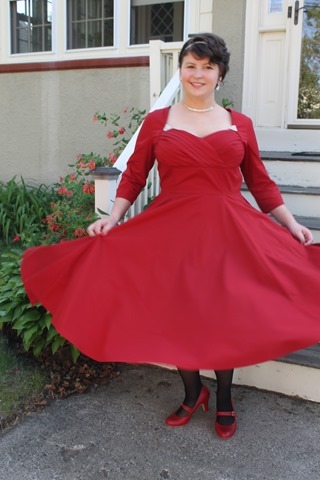 For a start, here’s Younger Daughter, decked out for Junior Prom. No copycat column dress for her, she took inspiration from decades past, and found a bargain repro-1950s dress on line. Much child/parent conspiring took place to round out the outfit. The rhinestones for example are excavated from my jewelry box, and ultimately belonged to my grandmother and great-aunt. Younger Daughter looked great, and had a wonderful time. And not a bit of envy for dance-able comfort from some of her more elaborately dressed peers. On the Trifles sampler, I ran into a roadblock. I tried drafting and tracing meshed gears, which I intend to use as a background, filling each one with a different counted blackwork-style filling. But I wasn’t finding a great amount of success. So I caved in and bought a plastic stencil. I’ll use selected bits of it, tracing the precision cut cams onto the cloth and tiling the thing where needed (it’s calculated to do that!). More on this once I get going. For the record, we’re both using SMC Select Reflect, a light DK/heavy sport yarn in rayon/cotton blend. I can say that both of us have had extreme problems making gauge and have had to adjust needle size and move down in selected garment size to compensate. 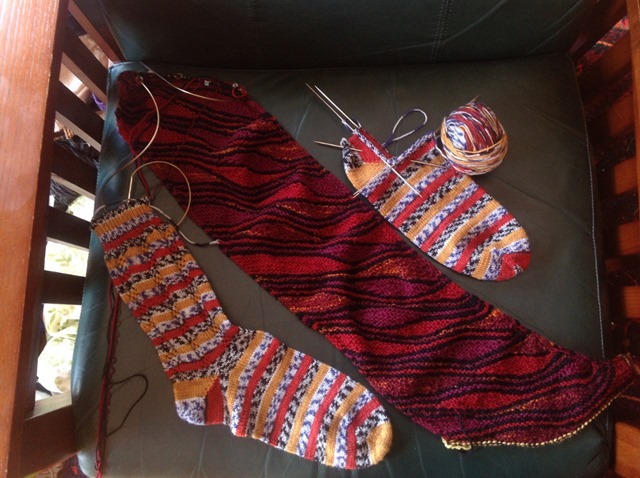 And I’ve done a ton of socks as I noodled out the various problems and challenges, above. 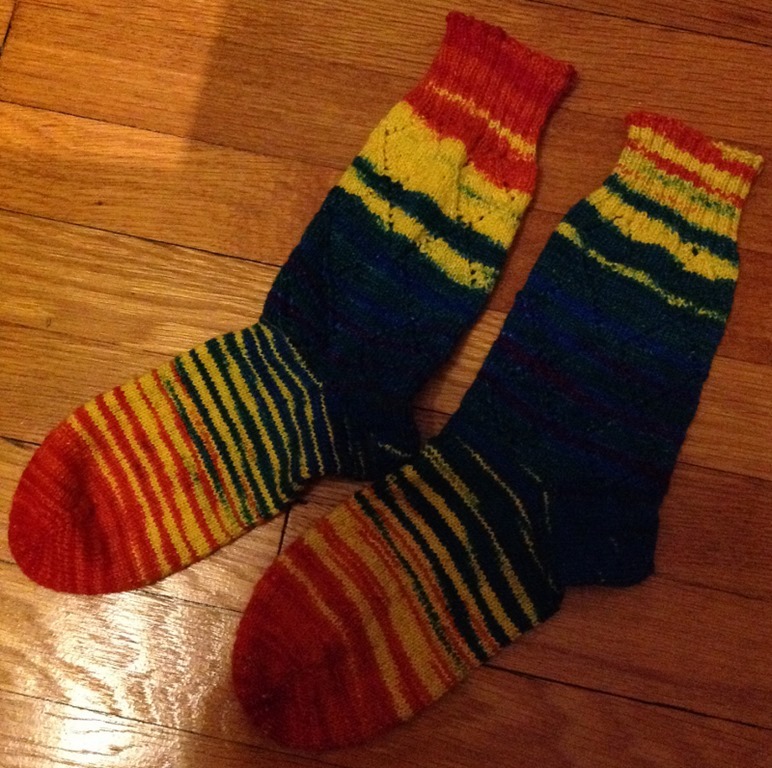 This pair was knit up from a hand-painted sock blank – Plymouth Happy Choices, in the Fiesta color. 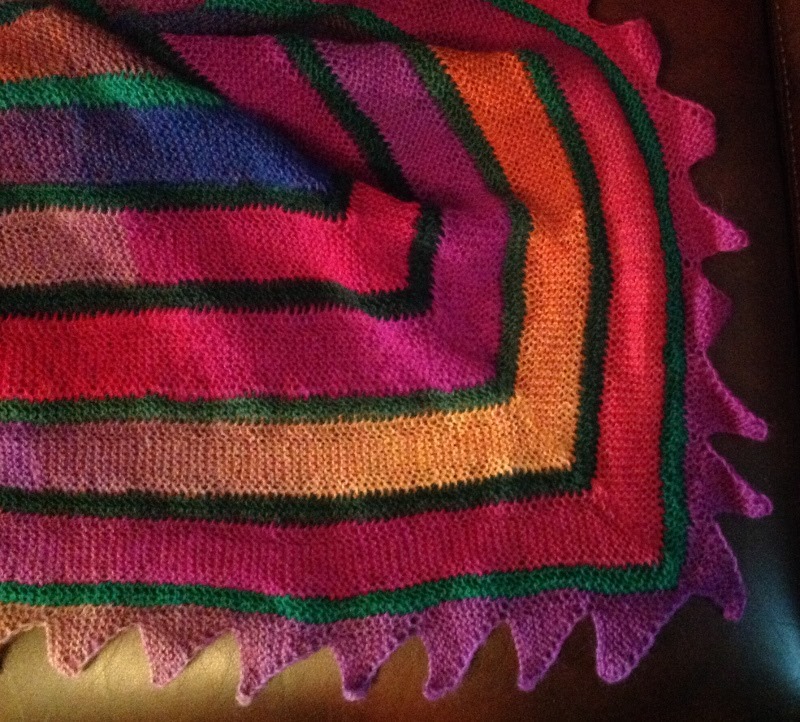 In essence, a sock blank is a long scarf-like machine knitted strip that a dyer then paints with her or his chosen colors. 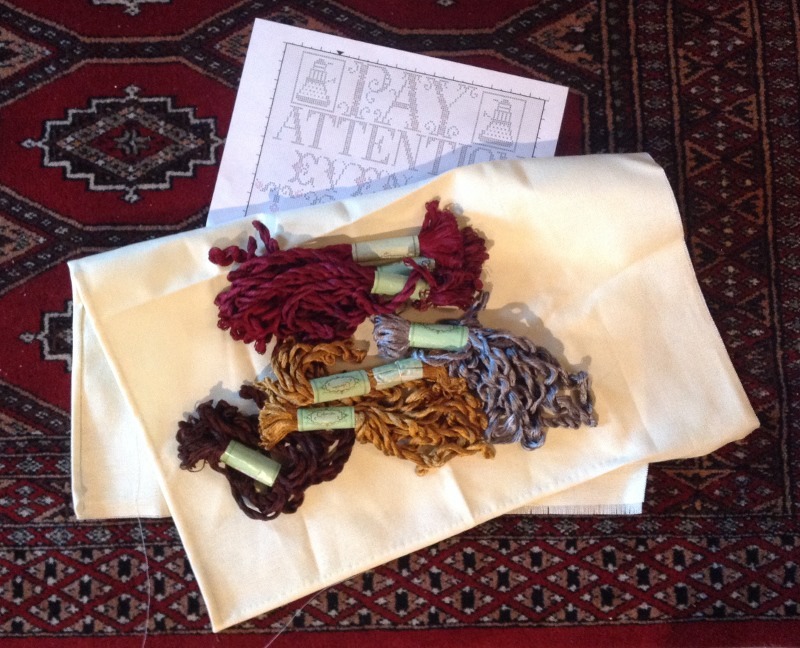 When the scarf is unraveled for use, its patterns knit up in unexpected ways. I knit mine straight from the blank rather than re-winding, working my standard figure-8 toe, short-rowed heel sock. The crinkle made no difference in the finished product, and the convenience of working from something that wouldn’t escape and skitter down six rows was perfect for airplane knitting. 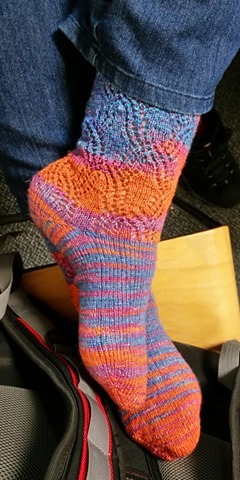 The lace pattern on the ankle is from Walker’s fourth treasury. 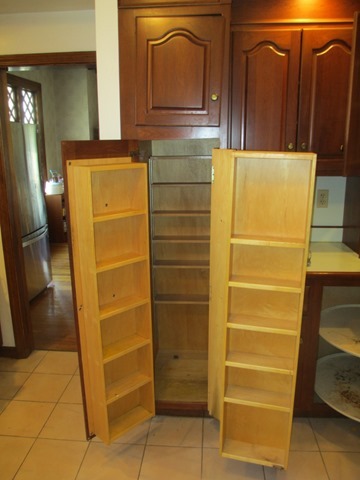 And on larger, family projects – we start to consider redoing our kitchen. 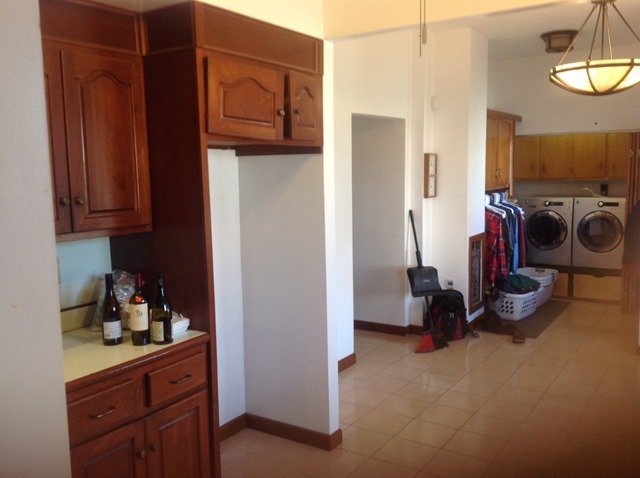 The floor tiles are worn past their surface color, the cabinets and countertops are sagging beyond simple repair or re-use, and the layout/look is inefficient and dated. The room was spruced up around 1980, as a peace offering between the warring couple that sold the house to us. I have detested the shell pink/mint green/faux Colonial cabinet combo from the day we moved in. Before pix in next post, for sure. Ten years is enough, and it’s time! Since the last post, admittedly almost two months ago, we’ve been re-nesting here in Arlington. The Resident Male returned from India, having done the final closeout of our apartment there, shipped our goods home, and said his goodbyes to friends and co-workers. He and I ran away for a second week on Cape Cod. We re-enrolled Younger Daughter in high school. Elder Daughter and I embarked on job searches. Our household shipment from India arrived, and we started the Great Unpacking. I landed in a great job at CyPhy Works, and have embraced again the daily commute, this time with an added morning detour to the gym. Now the school year has begun, and we’re almost back on normal routine. 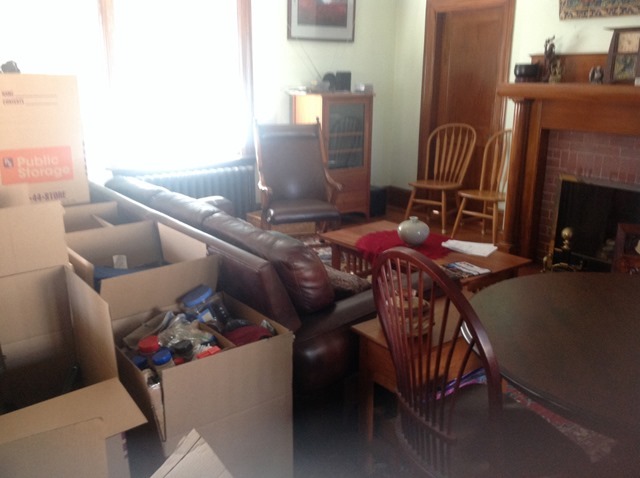 There are still pockets of disorder in our living and dining rooms that we are slowly addressing. Our India-bought rugs are back from being cleaned, and are now laid out in their new home. Our kitchen goods have been sorted, with some stowed against future need, and others (like the rolling pin and round cutting/rolling platform hand-made by Driver Rupesh’s father) installed for immediate use. 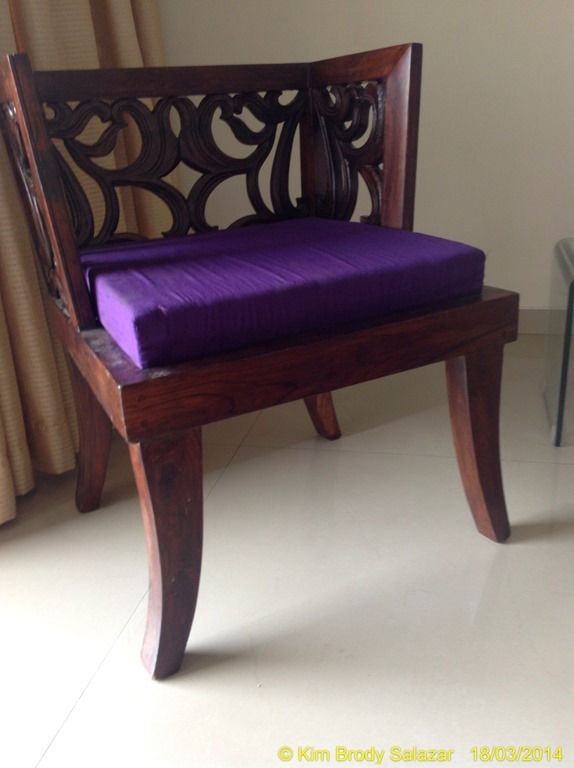 And the chair is back, with the seat cushion redone. I’m very happy with the result. 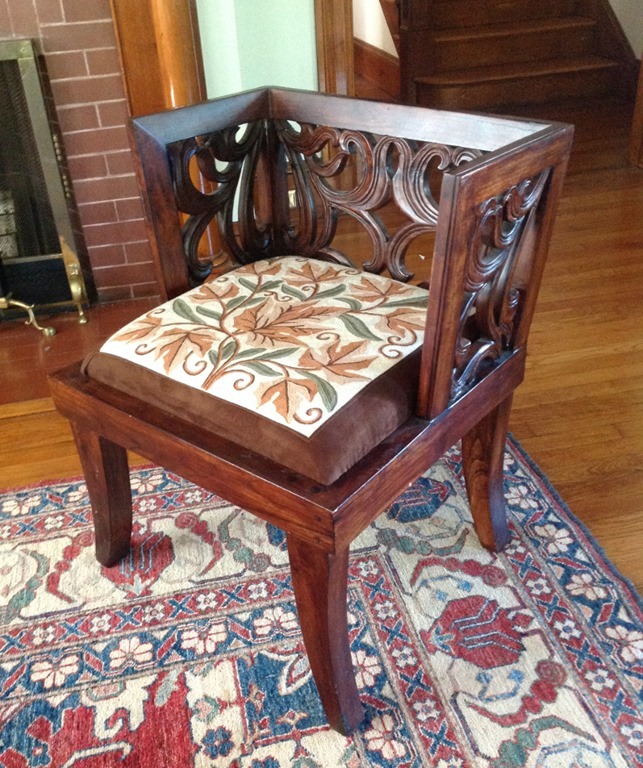 The curves of the stitched leaves echo the curves of the repurposed carved window treatment that makes up the chair’s back and sides. And it’s quite comfy, too. What’s on tap now? Dealing with that remaining disorder, craftily kept just off camera in the shot above; settling into the new routine; finishing Swirly – the big lap blanket; and finishing up The Second Carolingian Modelbook. More on all of this in future posts. And I promise you won’t wait two months to hear from me again. Now that we’ve been home for a few weeks, I can say that there are things I miss about India. One of them is our friend and driver Rupesh. We had lots of occasion to chat with him as we sat in traffic. He was our guide and intermediary to a new culture; his questions and his answers to our own questions made us think. One conversation we had early on was about our “native place.” Most Indians have one – an ancestral village or neighborhood where their relatives still live, and to which they return. Having a native place is a vital link beyond kinship to its residents – it’s an attachment to the actual area and the land itself. People are intensely proud of their native places, and follow everything that affects those places with great interest, even if they themselves are living in a city, far away. Rupesh spoke with great affection about his native place, describing the house he grew up in, the retirement house his parents were building there, village life,his family, and the crops grown in his family’s various small fields. Then he asked me about mine. Where was it? What was it like? What grew there? I admit I was at a loss. Like many rootless urban Americans, we have no single place for the family to call home. 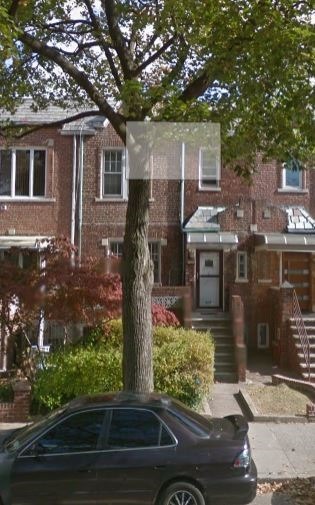 I suppose technically speaking, an avenue row house in Sheepshead Bay, Brooklyn New York would be my native place. We lived there until I was a teen, around the corner from one grandparents’ house and about 10 minutes away from the other. The shot at right is as it looks now on Google Maps – not quite the same as I remember, but even digitally, one can’t turn back time. Rupesh would be disappointed to know that very little grew there, at least not by the time my family lived there. Truck garden farms and horse stables for the local race track had long since been paved over and subdivided into attached houses. While I have deep memories of Brooklyn, walking to school and the neighborhood in which I lived, I have no particular attachment to it. I barely remember the people I went to school with, and have not been back there in a good 30 years. 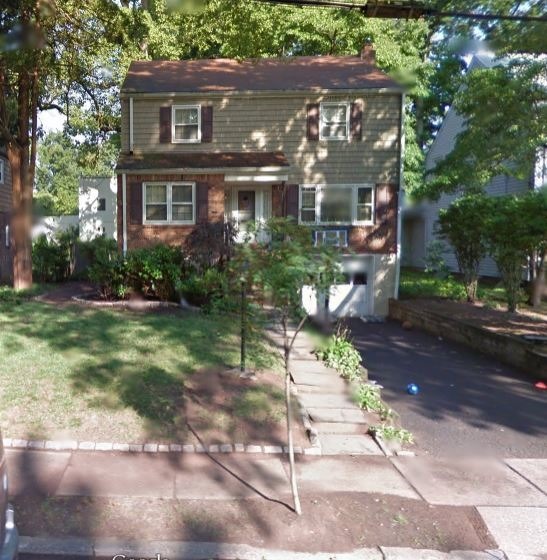 Next we lived in Teaneck, New Jersey. That lasted from middle school through high school. Again, an inner suburb, not quite as dense as Brooklyn, but long divorced from being anything other than a bedroom community. I do have fond memories of several school friends, and am debating attending an upcoming high school reunion. For agriculture, I did once try to grow carrots in the back yard. I got leafy tops, but no roots. So both I and the vegetables have no special ties to that little plot, either. My mom no longer lives there, so there’s no compelling reason to return. After that I went off to college, and a wild array of ever-changing dorm rooms. Nothing much settled down in the immediate post-college years, either. 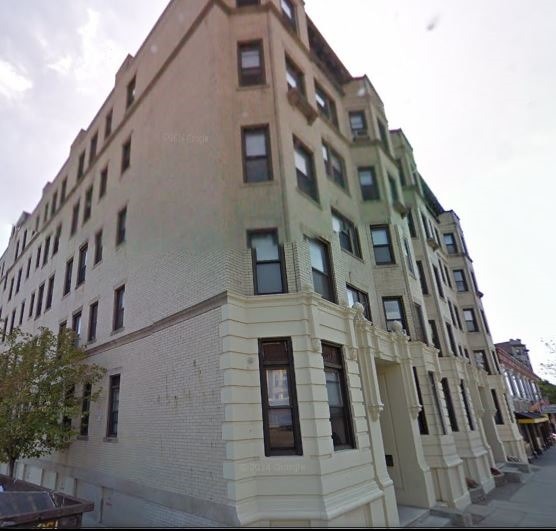 I bounced from one Boston area entry level apartment to another, sharing the places with roommates or roaches. Usually both. I wouldn’t call any of these residences home, let alone my special native place. Eventually I ended up in Washington D.C., jobs being more plentiful there than in Boston in the early 1980s. I will be forever grateful to the friends who let me couch surf in their tiny apartment for five months before I established myself and could afford to move to my own flat. 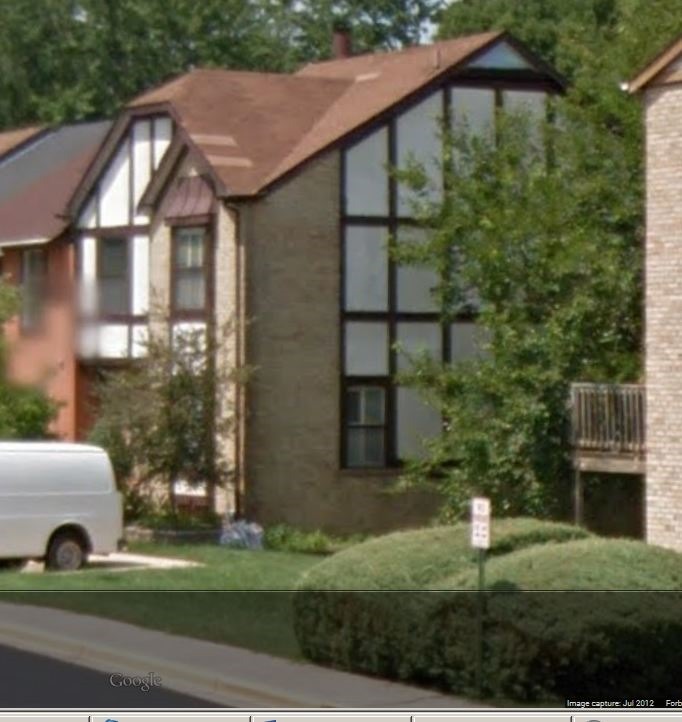 Fernando and I married and he joined me in my war against vermin in this College Park, Maryland building. Getting closer, but still no nostalgia. 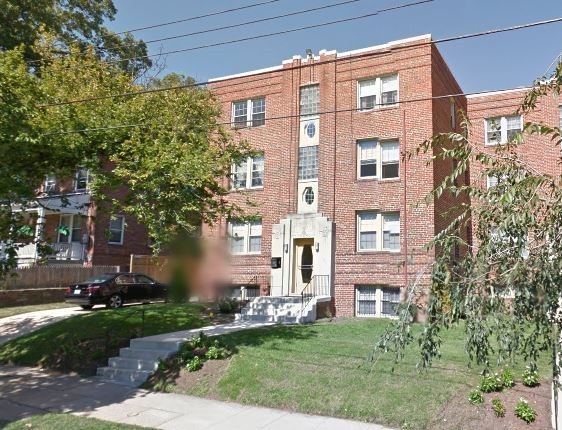 We moved to get away from the Roach Motel, and resettled in Washington, D.C. itself, in a small apartment village in Takoma Park. It was pleasant, although not air conditioned in the D.C. heat, and an easy walk to the subway, the dojo and many of our friends. 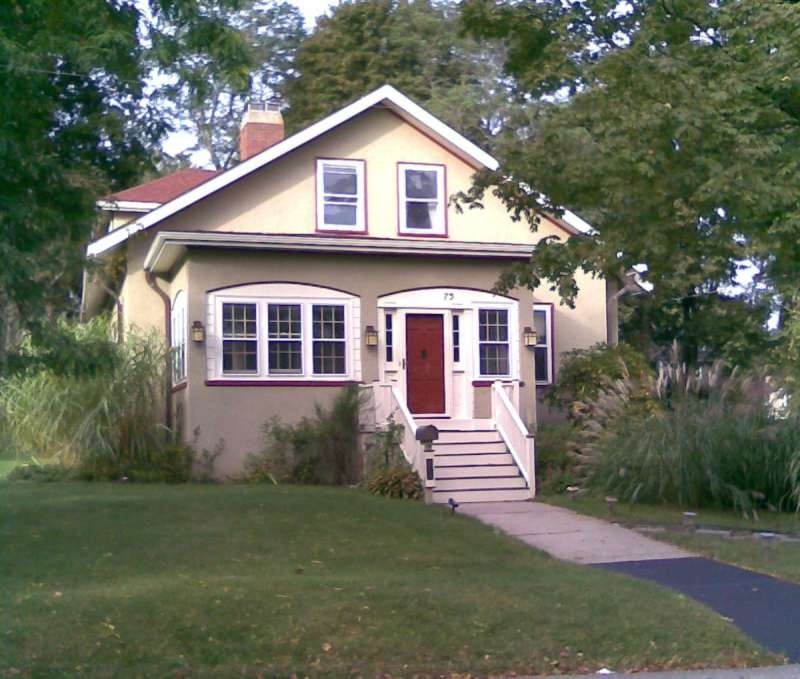 The best part was the low rent, which allowed us to save up to buy our first non-apartment home. We are now inching up on Rupesh’s concept of attachment. We worked hard on the house in Lanham, Maryland, and made very good friends with a neighbor, with whom we remain in touch to this day. Our elder daughter was born here. Through hard work, we tamed the muddy back yard and grew lots of flowers – cannas, mums, day lilies, Asian lilies, hollyhocks, marigolds, and others. I’d consider this to be our first real home. Better jobs beckoned, and we returned to Massachusetts. 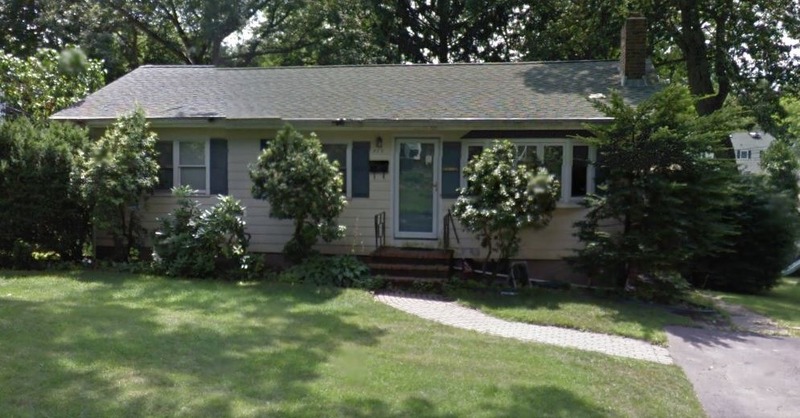 We did a lot of research and ended up buying our next home in Arlington – a tiny 1950s era ranch. Again, we did a lot of work on the house and grounds, finishing out the basement, making a garden in the back. I attempted cucumbers, garlic and herbs, with equivocal success. Younger daughter was born here, and we quickly grew out of the the place. 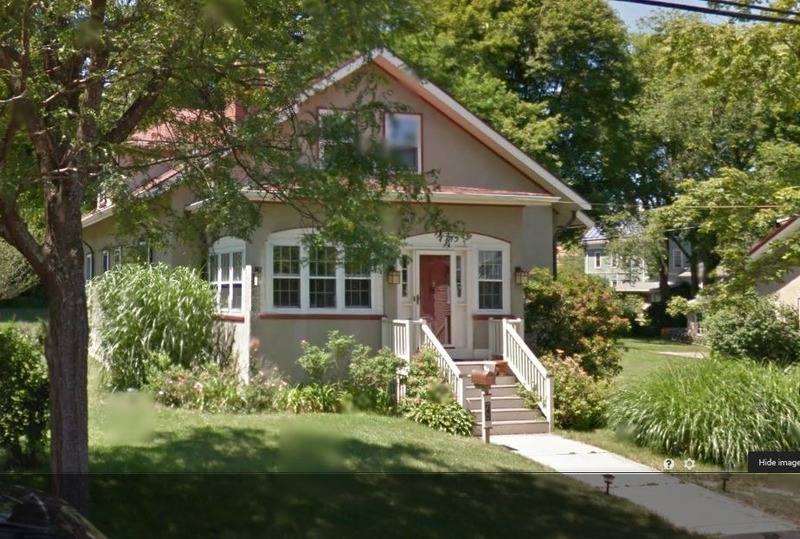 We liked Arlington, so we ended up staying here in town, but in a larger home – a 1912-vintage arts and crafts style stucco bungalow. We’ve been here for about 8 years now, and are still making improvements to it, slowly turning back 80 years of semi-neglect. We dabble in gardening, and have grown strawberries, climbing beans, and onions. Now, with all of these places I’ve lived in over the years (and mind you, I’ve omitted quite a few short term spots), it’s no wonder I was cast into thought about the meaning of having a “native place.” Both Fernando’s and my parents no longer live in the houses in which we grew up. We have no links back to any of our old neighborhoods. Our siblings, friends, and distant family are similarly scattered all over the US (with a few overseas). I had the impression that Rupesh felt slightly sorry for us and slightly confused by my answers, because we really had no geographic center of identity, attachment and affection. I am quite fond of our current home. Perhaps that may qualify as our native place now, but I prefer to think of this family as carrying our native place with us. My roots are shallow and easily transplanted. Although I love this house, if I had to go elsewhere, I would move. My identity is built more on my family’s ethical and moral legacy, what I have made myself into, what I have done, and what we as our own nuclear family have become. So I guess my native place is my own dinner table. Wherever that may happen to be. As you can probably tell by the off-the-end-of-the pier style of my knitting and stitching projects here, not everything is fully swatched, graphed out, or perfectly planned before it’s realized. This may horrify some readers, but it’s the way I think. I prefer to learn on the fly, and don’t mind ripping back or starting again. For me, exploration is more fun than final product. One thing that made the last two Wingspans so dramatic was the long and gradual shading of the Zauberball Crazy. This was achieved by Zauberball’s dual strand ragg plies each cycling independently through their color ranges. In this full strand as opposed to ply-dyed yarn, color change is abrupt and the colors themselves are high-contrast. Speckles of the next color dot each block. (Now I remember starting socks with this ball, and not liking them either). The holes look less like airy bubbles, and more like the savaging of a demented moth army. And the eyelets, which work nicely in stockinette, look sloppy in garter stitch. In total, I was Not Pleased. So this has been totally ripped back. I may play a bit with other stitches and this yarn, but in spite of it being a looonnnnngggg repeat, I am not confident that it’s right for a garter stitch Wingspan. 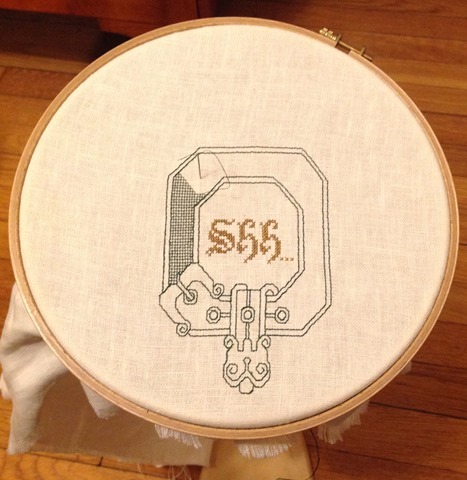 However, the technique of placing eyelets in a fabric using a randomizing device to determine placement is still gnawing at me, as is thinking about other possible Wingspan variants. As a single project, this is a failure, but as a learning experience, it was valuable. 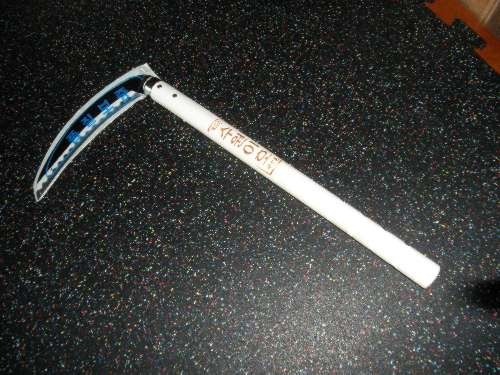 It’s a Korean-made sickle, sharp and sturdy. Similar ones have been used in Japan for centuries. They often figure in Anime, Samurai (and gangster) movies, both in their agricultural context and as weapons. We are close-in suburban here at String Central, and not out in the land of gentrified sprawl, so why do we need such a thing? I cut the patches on the side and front of the house each fall, just after they bloom but before they scatter seed. I don’t want to be responsible for colonizing the neighborhood with the stuff, and I don’t want it to sit looking forlorn and frowzy through the winter. To date I’ve been clipping each stalk with a pruner, but that’s painful and time consuming. I am hoping that this tool will allow a swifter handful by handful harvest. For those concerned with possible waste – I strip the leaves off the stems and re-use the stalks to build my bean trellis each spring. 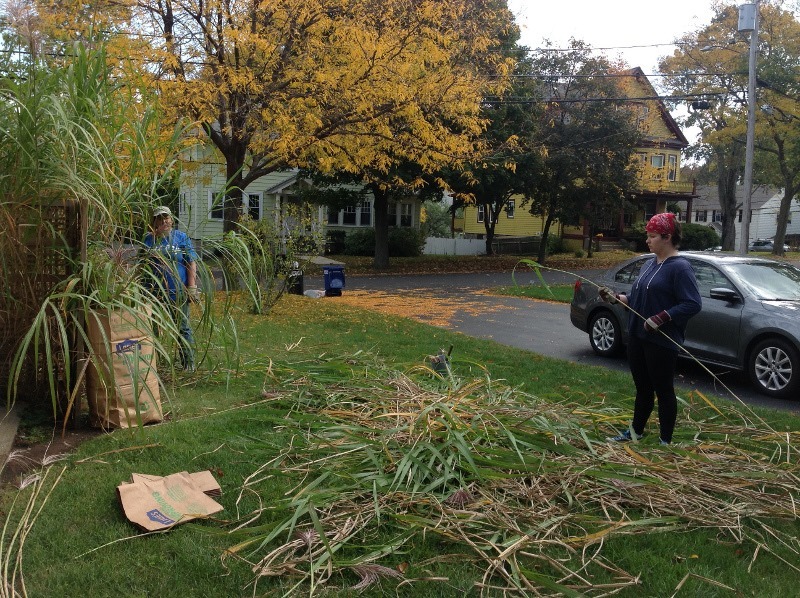 The leaves go to town composting. I also post about availability of (free) plant stakes each year on the local mailing list, and put them out on the curb for other gardeners to take. Trust me, it’s MUCH easier to work LACS inside an outline. I did it “feral,” (without outlines) on the large dark panel in the center of the left edge. Plain old cross stitch is easier to count than LACS with its braided surface texture. That one panel probably took twice as long to do in LACS as a result. This band is moving along much faster. Another two weeks tops, and I should have the entire bottom edge finished. An aside – there’s a mistake in the current strip. Pat yourself on the back if you can spot it! In other news, The Resident Male has a project to showcase this week. 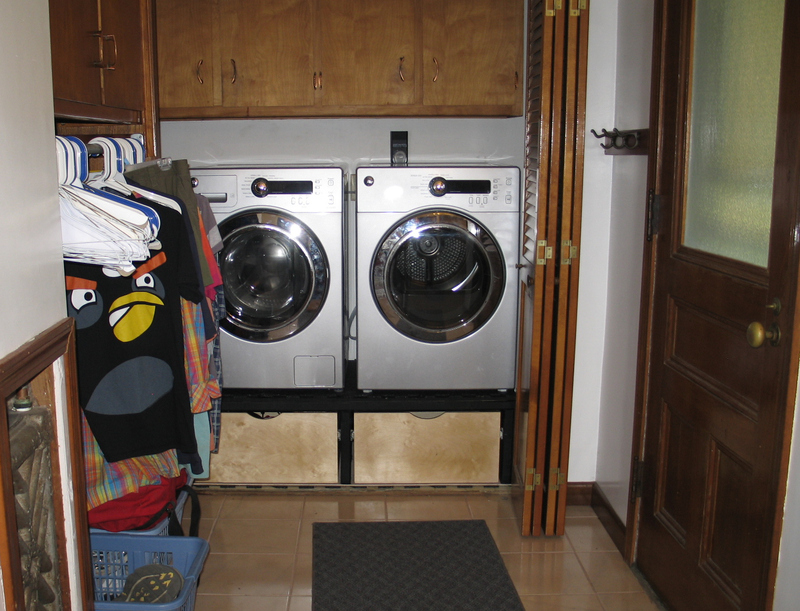 In the spring we finally replaced our Carter-era washer and dryer with ones that work. 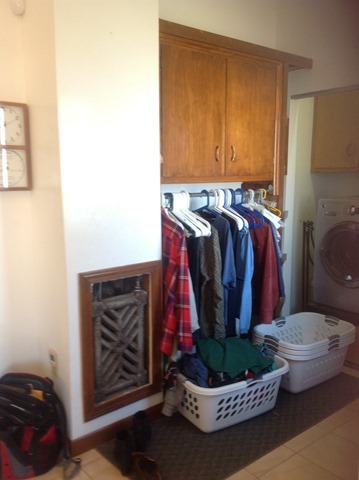 Because we had to fit them into an existing alcove, and I wanted efficient front loaders, that took a bit of shopping around. Most front loaders on display in this area are giant capacity/top of the line units or are mini capacity apartment size stackers. Big ones wouldn’t fit in the space we had available, and with kids, we wanted more capacity than the smaller, stackable models. We finally tracked down some mid-size GE units, well reviewed with good repair records, and ordered them. We now have two drawers for storage of once-a-year type kitchen impedimenta – like the big turkey roasting pan. And no more reaching in for that last sock on hands and knees! I declare this project a success. Now how does the new washer perform? It cleans much more thoroughly than my late 1970s/early 1980s vintage Kenmore did, even removing stains I thought were lost causes. The washer/dryer pair sip water, detergent, and energy, noticeably decreasing our consumption of each. And they’re quiet. We can now sit in the kitchen (behind the photographer) and have a conversation while the machines are running. But there are also a couple of minor drawbacks. Cycles take twice as long to complete; the mid-capacity model holds less than the old top loader, so there is one more wash per week; and for some reasons, sheets twist themselves into Gordian knots in the dryer, and do not dry well, unless I take the time to re-assort them several times mid cycle. Drawbacks aside, the new set-up is far superior to the old one, and the raised platform is the icing on the cake.